Happy Valentine’s Day! This sounds like the perfect dessert for those of us who can never decide if they want either a brownie or a cookie. Now we can have both! 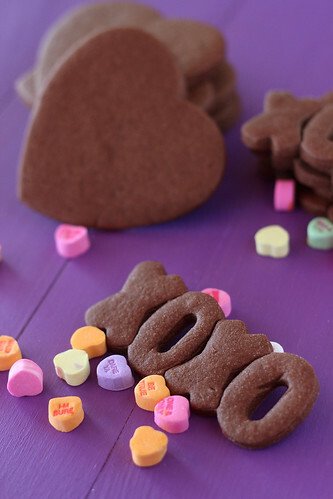 Love these, and I’ve been wanting to make these cookies, too! I love your new purple prop board! Hope you and Jesse have a wonderful Valentine’s Day! What a fabulous idea! 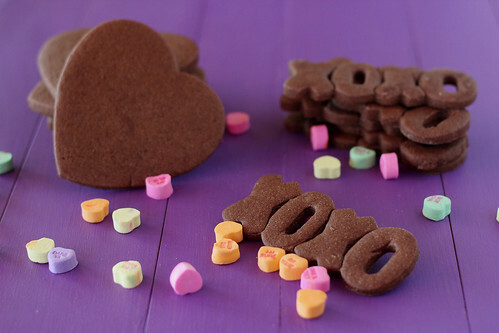 I’m a brownie gal, myself, and would be ALL over these! I made these tonight, the dough was very thick and challenged my mixer quite a bit, then when I attempted to roll the dough out it was very crumbly. Also I didn’t get even two dozen out of the batch. They were delicious though. Any hints on how to solve these issues? Because we can all measure things just a little bit differently, I can see how the dough could take on different textures. If this were to happen to happen to me, I would probably try adding a tablespoon or so of milk.